The Texas Rangers made a dream come true for their organization and their loyal fans on October 22, 2010, by clinching a trip to the World Series for the first time. Dallas-Fort Worth has been a fun place to be this post season. I have been thrilled for all my friends who are huge Rangers fans. The Texas ball club exuded a spirit of excitement and confidence though their series with the Tampa Rays and the New York Yankees. Team members have demonstrated a boy-like charm that draws you in and urges you to cheer for no one else. However, during and after Wednesday’s Game 1 in the World Series against the San Francisco Giants, I began to wonder…What is this Rangers team really made of? A Cliff Lee vs. Tim Lincecum match-up was sure to be a pitcher’s duel for the record books. Ultimately, the fascination was not at the astounding pitching, but how far off the mark each former Cy Young winner was. Cliff lee gave up seven runs and five doubles in 104 pitches before leaving the mound in the middle of the 5th inning. Prior to Game 1, Lee’s post season ERA was 1.26. You saw him against the Yankees, you saw him in the 2009 World Series with the Phillies. The Rangers have hung their momentum on this 6’3” starter from Arkansas. When Lee is dominating it is easy to follow his lead, but how will the Rangers push though when Lee is off balance? The answer to this question is what the Rangers are really made of. With Lee in the dugout the Rangers’ bullpen allowed four more runs. You can credit Mark Lowe with three of those runs. In the meantime, Giants ace Tim Lincecum was taken out after 5 2/3 innings. He was lacking his freakish spark that normally follows him to the mound. Did the Rangers take advantage? Not as they should have. 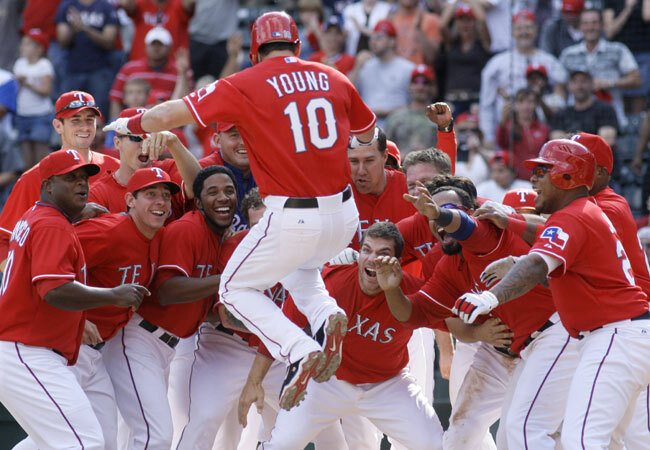 Though Texas had 11 total hits, All-Stars Michael Young and Josh Hamilton did not add to that number. It was worse in the field. The Rangers had four errors: one each by Young and Elvis Andrus and two by Vlad Guerrero. Additionally, where was the base running we saw in Game 5 against the Rays at the Trop (Tropicana Field in St. Petersburg, Fla.)? In an ALDS 5-1 victory led by Cliff Lee on October 12, 2010, the Rangers showed the world what “run like a deer” really meant. This game showed some of the most impressive base running I have seen, with Andrus inspiring his team mates to follow his quick step. Speaking of Elvis Andrus, instead of stealing bases he was noted for his clumsiness Wednesday night, kicking a ball with his foot for an error. Andrus has what it takes to light a fire under this Rangers team. Signed by Atlanta at the age of 16 in 2005, Andrus was traded to the Rangers in 2007. In 2008, I was at Dr. Pepper Park in Frisco watching my friend Ole play for the Corpus Christi Hooks (Houston Astros AA team) in a game against the Roughriders. (Ranger’s AA team) My friend said to me, watch out for that Elvis kid…he will be starting for the Rangers next year. I took one look at the skinny guy and said…no way! He was fast though, and he could hit the ball. “Skinny Kid” started the 2009 season with the Texas Rangers as a 20 year old short stop, after Young agreed to move to 3rd base. I am struck by how well he has done…and by his current size. He has grown into a big league star…now the Rangers need him to lead like one. Question is...do the Rangers have what it takes to step and win after an off night? Thursday’s Game 2 of the World Series did not prove that they could. A 9-0 shutout by the Giants and starter Matt Cain was hardly the turnaround we had hoped for. Though fielding was improved with zero errors, Andrus, Nelson Cruz and David Murphy came up hitless. Andrus did steal one base, and CJ Wilson only gave up two hits. The Rangers bullpen continued their lack of control, allowing seven runs. Naftali Feliz did not make an appearance….shouldn’t he have? What’s Not to Hate? Why it is Easy to Despise the Yankees. Another season…another exciting trip to the post season…another humiliating sweep by the Yankees. This is the status of the Minnesota Twins and all who invest their loyal fandom into this club. I had a sinking feeling in my stomach the day I heard the Twins would face the Yankees in the 2010 ALDS (American League Division Series). This immediate reaction to a defeat not yet realized, was the result of knowing all too well the history of the Twins vs. Yankees post season play. 2003, 2004, and 2009 resulted in a 9-2 record in favor of the Yankees over the Twins in post-season match-ups. For the second season in a row, the Twins would face the Yankees in round one. The 2009 remarks of “David vs. Goliath” rang in my head. However, in 2010 Minnesota had home field advantage and would play their first playoff game outside in the Twin Cities (Target Field) for the first time since 1970. The American League Central Champs should be able to knock off the AL wildcard right? No…second year in a row equaled the second 3-game sweep in a row for the Yankees over the obviously mentally blocked Twins. Remember that sinking feeling I mentioned? This wasn’t just the feeling of a fan who knew the upcoming challenges her team would face…I hate…despise…detest…the New York Yankees. To a point that leaves me a bit nauseous. 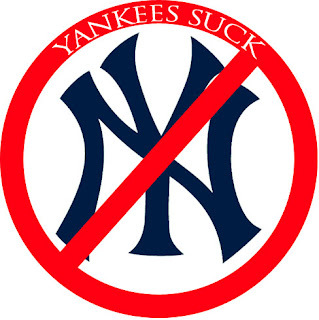 The New York Yankees…you love them or you utterly hate them. Am I right? It’s like Notre Dame, or the Dallas Cowboys. The Yankees are the most beloved baseball team in America, as well as, the most loathed. I can’t tell you why people dislike the Yankees. I can, however, touch on why I personally flinch when they are mentioned. See if you can relate…or are you a Bronx Bomber faithful? 1. All of the above: They lord over my team every year! In this decade I would guess that the Yankees are hated most in the Twins Cities…second only to Boston. What’s not to hate? 2. Money isn’t everything. Just ask the Tampa Bay Rays. However, it obviously does not hurt. The Yankees have a current payroll of $206,333,389. Nasty. This is the second highest payroll in MLB history. I must note that money, though it does not hurt, doesn’t always help either. The highest payroll in history was the New York payroll of 2008 ($209, 081,577). Ask Yankees fans who they cheered for during that post season, as their boys also watched the playoffs from home. Still…with all that money and clout being thrown in our faces…what’s not to hate? 3. New York, exorbitant amounts of cash flow, celebrities vowing allegiance, clean-cut pretty boys. This could go one of two ways. But, I say give me down-home All-American boys (or even one hot 1st baseman from British Columbia), raised up from a successful farm system, playing in a smaller market, with fans like you and me. You can’t walk a mile in NYC without seeing Derek Jeter in some advertisement, in some window. Those Yankee boys even pose when they are sliding home! Their every movement is calculated because they know all eyes are on them. A little too much like Paris Hilton for me! What’s not to hate? 4. Last, the “there is nothing and no-one money can’t buy” principal. I was somewhat of a Rangers fan a few years ago. My favorite players? A one Alex Rodriguez and a one Mark Teixeira. A-rod (or as I like to call him…A-fraud) was brought to Texas making history with his $252 million contract that would have ended in 2010 (can you imagine?). A-rod was the 2003 AL MVP (leaving the illegal substance thing alone here). However, the Rangers came in last place in their division the three years he was on the roster. In 2004 New York bought out this contract. A-rod has won MVP awards in 2005 and 2007 since that trade. Mark Teixeira (Big Tex) started his rookie season in 2003 for the Rangers. After brief stints in Atlanta and LAA, he was signed to a contract of 180 million over eight years for the Yankees 2009 season. Perhaps the most shocking and unsettling trade…Johnny Damon’s jumping of the ship from the Boston Red Sox team he pivotally helped win a World Series for in 2004 to his arch rival. In 2006, after campaigning for a larger contract, even to Red Sox skipper Terry Francona, Damon signed a $52 million over four year contract with the Yankees. In reports, Damon basically said the he urged Boston to pay him more money, but the Yankees players were calling to recruit him and they did a good job of it. Please note the agent for all three of these All-Stars: Scott Boras. Mammas don’t let your babies be represented by Scott Boras! While you’re at it…pray your favorite player doesn’t get nabbed by New York. Every offseason fans fear the Yankee front office, as well they should. What’s not to hate? Fact is…the Yankees are good. A little too good. A little too easy to hate!